NEWS ALERT. 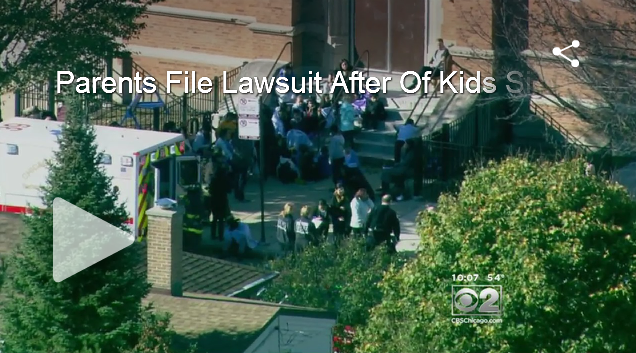 Brain Injury Law Group files first legal action in Prussing Elementary School in Chicago, Carbon monoxide poisoning case. Click here for more. CBS Report. Parents at Prussing Elementary want someone to pay for making their kids sick during a carbon monoxide scare and now there’s a lawsuit. Click here for article. Carbon monoxide poisoning is called an invisible killer. Carbon monoxide is an odorless gas that when inhaled sneaks into the blood stream, masking as oxygen. Yet carbon monoxide poisoning should never happen as this poison should never be in an enclosed place where people might inhale it. This is especially true in the places carbon monoxide does the most damage – homes, hotel rooms and schools. Carbon monoxide poisoning kills the bodies cells and organs in two ways: first by taking something away (oxygen) and two, by leaving a toxin behind. While the lack of oxygen can asphyxiate the cell, more damage happens in many cases by the toxin, which becomes a slow acting poison which continues to attacks the body’s defenses for weeks. Carbon monoxide is part of the exhaust any time a carbon fuel is burned (like gasoline, natural gas) but especially when carbon fuel is burned where there is insufficient oxygen supply for the fuel to burn cleanly. The normal result of burning fuel is the creation of carbon dioxide, CO2. When there is insufficient oxygen, carbon monoxide is the by-product, CO, for a molecule with only one carbon atom. Most warnings about carbon monoxide poisoning relate to warnings about the risk associated from the exhaust in cars. As a child in the 1960’s, we were warned about the dangers of letting your car running in an enclosed space, like a garage. Yet, car exhaust is not the only source of carbon monoxide. It can occur anytime an engine is converting carbon fuel into energy or heat. Examples, furnaces burning natural gas for heat. Hot water heaters doing the same. Electrical generators burning gasoline for standby or emergency electrical power. Boat motors. The key element in almost all carbon monoxide poisonings is failure to get the exhaust out of an enclosed space. While this can happen by accident with a car exhaust, if it has something to do with the HVAC system such as hot water heaters or furnaces, there is almost always more than one party who has fault or negligence. As no HVAC system should ever allow for the release of carbon monoxide poisoning, the installing contractor and/or the contractor responsible for maintaining the HVAC system has committed a life threatening negligence action whenever someone gets a carbon monoxide exposure in a building. But the building owner will in all likelihood also have responsibility for death and injury as a result of carbon monoxide poisoning. The first place most fire investigator’s look for blame after an carbon monoxide poisoning event is the integrity of the exhaust system for the heating appliance. But while that may be the immediate source of the poisoning, the ultimate cause may be because the heating appliance had inadequate oxygen to burn, first creating the carbon monoxide in the first place and second, causing damage to the exhaust ventilation system, from what in the business is called negative pressure. What negative pressure means is the exhaust gases back up before being completely vented from the building.